Dozens of community organizations and several families that have lost their loved ones to extra-judicial killings by police are set to meet at “Justice for Our Communities! 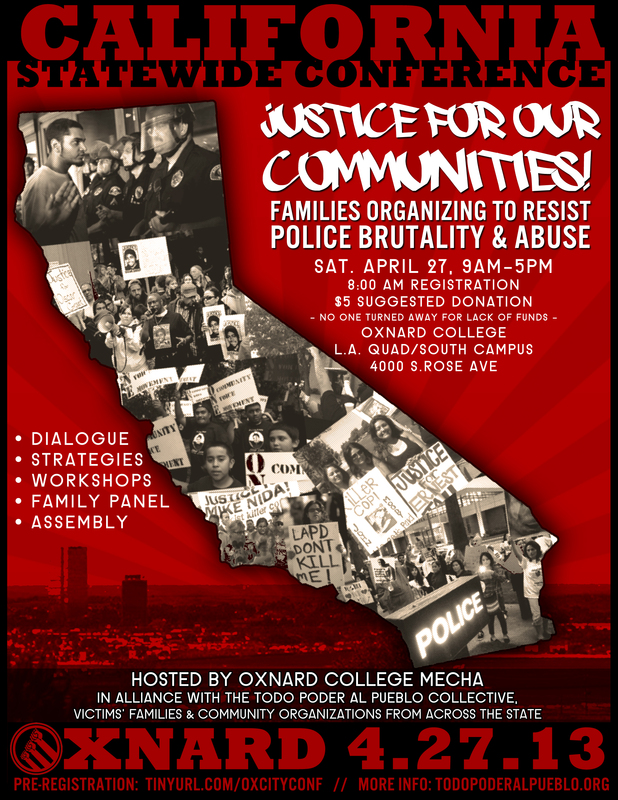 Families Organizing to Resist Police Brutality and Abuse”, a statewide conference that will be held Saturday April 27, 2013 at Oxnard Community College, 4000 South Rose Avenue, from 9am – 5pm. This groundbreaking civil rights conference will consist of several keynote addresses, workshops, and educational/legal panel discussions, as well as a discussion and special session for police brutality victims and their families. Speakers will include the survivors and relatives of deceased victims of extra-judicial killings such as Robert Ramirez (Oxnard), Oscar Grant (Oakland), Kelly Thomas (Fullerton), Manuel Diaz (Anaheim), Michael Nida (Downey), Jose de la Trinidad (Inglewood), Ernest Dueñez (Manteca), and Andy Avila (Pomona), among many others. This conference is a component in the ongoing grassroots community resistance that has been spurred on across the state in response to a soaring rise in police militarization, brutality, and officer-committed abuse in working class neighborhoods and communities of color. This conference will create an opportunity for the planning, coordination, and organization of statewide events and actions to address and bring an end to these injustices. The Honorable Cruz Reynoso, the first Chicano Associate Justice of the California Supreme Court, a Presidential Medal of Freedom recipient, and professor emeritus of law at UC Davis, will deliver a keynote address on the civil responsibilities and rights which citizens and residents enjoy in our state and country, civic engagement to better our communities, and his ongoing involvement in fighting for justice for victims of police violence in the Yolo County/Sacramento area. Other keynote speakers include former LAPD Ramparts Division officer Alex M. Salazar, who will address the increase in police killings, the impacts of Post-Traumatic Stress Disorder (PTSD) amongst officers, and the racism engrained in the culture of police agencies. Los Angeles-based independent journalist and author Thandisizwe Chimurenga will also speak about the permanent bias in media outlets in their coverage of extra-judicial killings, and the role independent community journalism can play in reshaping the narrative and allowing the pleas of victims’ families to be heard. Minister Keith Mohammad of the Nation of Islam, a key leader in the fight for justice by the family of Oscar Grant (killed in 2009 by BART police in Oakland), will also be speaking at the conference. The conference is being hosted by Oxnard College MEChA. It is being organized by the Oxnard-based Todo Poder al Pueblo Collective (www.todopoderalpueblo.org) in alliance with sponsoring and endorsing organizations including Chicanos Unidos, Decolonize Oakland, the KEYS Youth Leadership Academy, the Labor Council for Latin American Advancement AFL-CIO (Sacramento), LULAC Downtown Oxnard Council 3128, National Brown Berets, Nida’s Ridaz, Occupy the Hood (Los Angeles), the Oscar Grant Foundation, People’s Community Medics, Stop LAPD Spying, Unión del Barrio, and many more.